Following the end of the Boer War, the War Office was concerned that in the event of another war the medical and nursing services wouldn’t be able to cope sufficiently. The peacetime needs of a standing army, in relation to medical care, were very small and specific, and to find thousands of trained and experienced personnel at very short notice, without the expense of maintaining them in peacetime, was a difficult problem to overcome. R. B. Haldane’s new Territorial scheme of 1907 solved some of those problems, and opened up new possibilities of co-operation between voluntary agencies and the Army, and on the 16th August 1909 the War Office issued its ‘Scheme for the Organisation of Voluntary Aid in England and Wales,’ which set up both male and female Voluntary Aid Detachments to fill certain gaps in the Territorial medical services, with a similar scheme for Scotland following in December of that year. By early 1914, 1757 female detachments 519 male detachments had been registered with the War Office. The female detachments varied in size according to local conditions, but in the main consisted of a Commandant, a Medical Officer, a Quartermaster, and twenty-two women, two of whom were to be trained nurses, and pre-war the Detachments varied in how seriously they took their responsibilities. Some didn't take their responsibilities too seriously, while others were intent on being well-prepared for a role that they might never be called upon to fulfil. The detachments were intended for home service only, to staff auxiliary hospitals and rest stations and they received no payment or salary for these duties - all the women would have been in a position at least initially, to give their services for free. 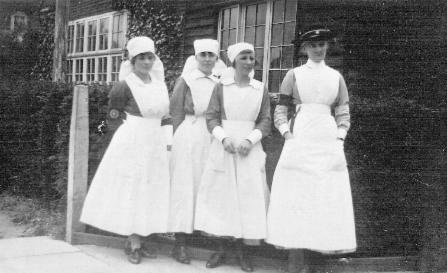 Detachments had to meet at least once a month, with many meeting as often as weekly, and women had to work towards gaining certificates in Home Nursing and First Aid within twelve months of joining, and they learned to bandage, to do simple dressings, and the basics of invalid cookery and hygiene. In some areas it was arranged for them to go into local hospitals for a few hours each week to gain an insight into ward work, and due to the low number of men being recruited in certain places, women could also gain experience in outdoor activities, stretcher duties, the transport of sick and wounded and improvisation with whatever came to hand. During wartime the VAD organization was administered by the Joint War Committee of the British Red Cross Society and the Order of St. John and run from Devonshire House in Piccadilly, loaned for the War by the Duke and Duchess of Devonshire. Many of the senior administrators were educated women who had been involved in the movement since its beginning and had a proven record of good organisational skills. There were about 50,000 women involved in the movement immediately before the war, and it's thought that in total somewhere between 70,000 and 100,000 women served as VADs at some time during the war, some for very short periods, some for up to five years. Although many members of Voluntary Aid Detachments left memoirs and accounts of their own wartime lives, there is little written about the VAD organisation itself, and it's not easy to discover the inner workings of the organisation, its day to day life, the administration and the difficulties. In keeping with much of the rest of this site, I'm endeavouring to answer some of the questions by adding transcriptions of original documents produced by the Joint War Committee during wartime. Although they form a mere patchwork, they provide much detail about basic conditions and terms of service not easily found elsewhere, and a fascinating insight into the wartime life of a VAD. The pages have been divided into five headings, but it's not always easy to pigeon-hole these documents, so apologies if some seem to be in the wrong place.